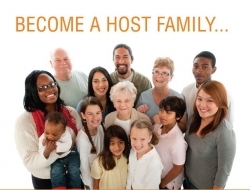 ELS Language Centers is looking for qualified host families for 2017-18. Host families must be able to provide each international student with a private bedroom, nearby bathroom (private or shared), and daily breakfast and dinner. To enhance language learning, the family is asked to speak/communicate with student(s) in English and share American culture and customs. The time period varies, but most students stay for three to six months, studying full time at ELS. Students study Monday-Thursday, 8:30 a.m.-3:45 p.m., and Fridays, 8:30 a.m. to 12:20 p.m. Families will receive monthly compensation for their hospitality. If you are interested in learning about different cultures by hosting an international student, contact us at 859-622-2510 for more information. Ask for Carlee, or send an email to creiff@els.edu.